Pay By Phone Casino | Unlock Free Spins @ Lucky Admiral! Phone bill payments offer security and simplicity, and are available at Lucky Admiral Casino. Here, you can learn all about paying by phone bill. Sign in and visit Lucky Admiral’s cashier. Select Pay by Mobile as your preferred payment method. Submit your mobile number for confirmation. Wait for a verification code to reach your device via text message. Enter the verification with the cashier to connect your phone bill. Choose a deposit of £10, £20, or £30 and complete your transaction. Use the funds to start enjoying bonuses and games. 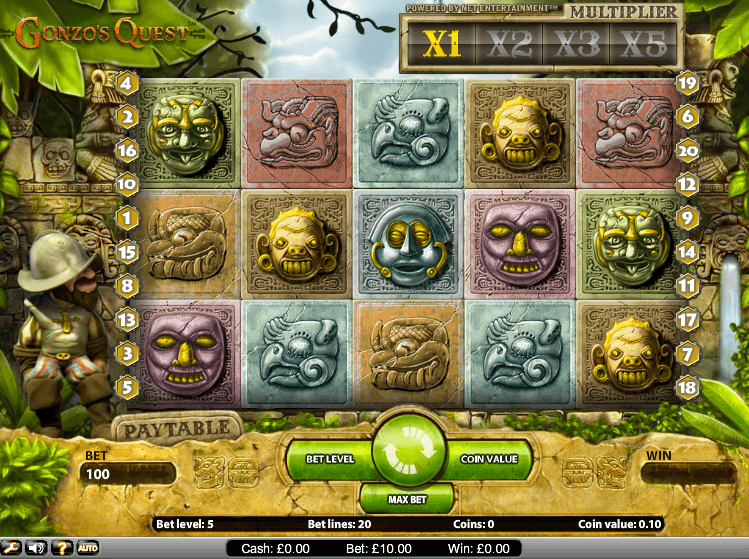 Lucky Admiral is a pay by phone casino UK destination that will also have you covered for bonuses and games. We have worked long and award to secure a competitive selection for you to enjoy whenever you sign up. Lucky Admiral will give you a chance to spin the Mega Reel and win up to 500 free spins on two of the most popular mobile slots around: Starburst and Fluffy Favourites. VIP Scheme: Keep wagering to earn free spins, cashback, and other perks. Happy Hours: 3pm until 7pm Wednesday will be your chance to earn free spins. Lucky Admiral has more than 300 casino games that take the form of blackjack, roulette, and video slots as the biggest categories. 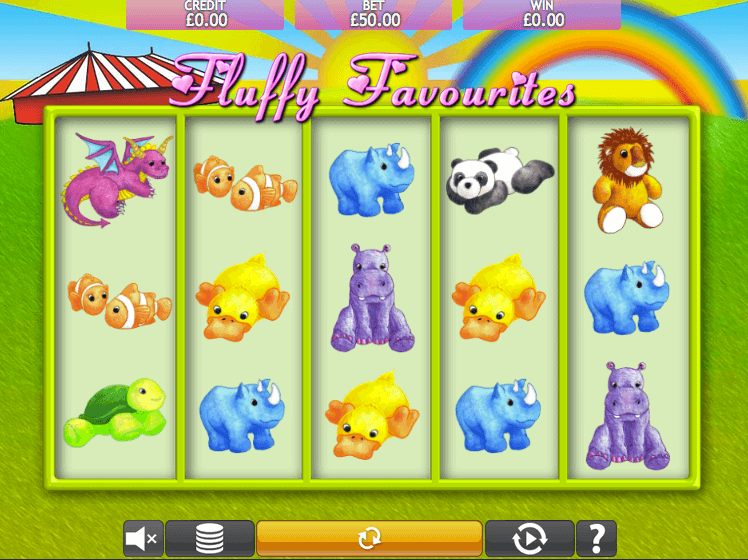 The slots are particularly great for enjoying the bonuses. Providers like Jumpman, NetEnt, Eyecon, and NextGen have delivered outstanding options like Starburst, Warlords: Crystals of Power, Fluffy Favourites and Foxin’ Wins. 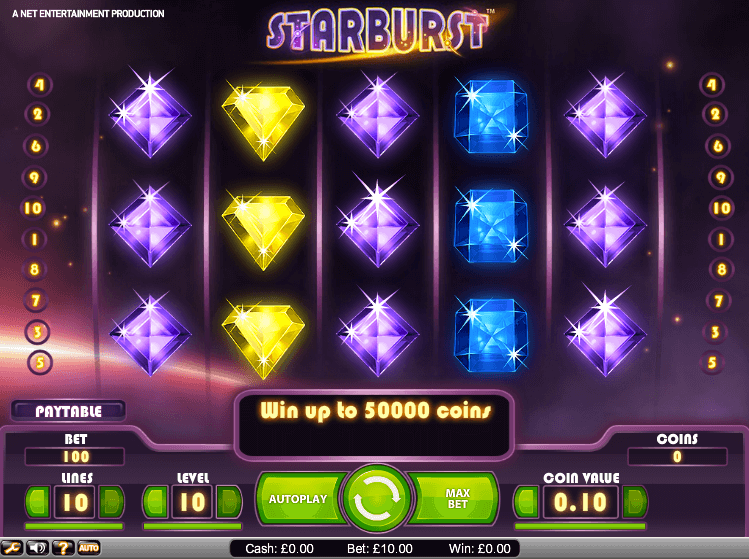 Starburst Slots by NetEnt is a dazzling and relatively abstract theme from the masters of 3D animated slots. By NetEnt’s own standards it is one of its simplest game plans. With RTP just over 96% it has a nice balance of risk and entertainment. Another of NetEnt’s classics, this one may be the slot that put the brand’s name on the map. Gonzo’s character keeps you company on the side, and there are engrossing side games and amazing stone symbols falling down the reels. Eyecon really turned out a runaway success with its Fluffy slot, which has been popping up on many of the world’s hottest sites. The game is all about plush toys, and its solid mechanics deliver endearing spins. 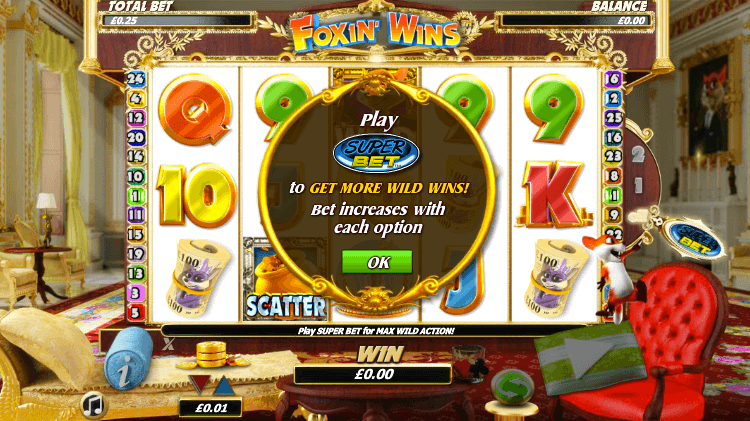 Rapidly becoming a modern classic, Foxin’ Wins slots by NextGen (there is a sequel now) follow its posh fox’s adventures living the high life, and features an explosive Fox Pups bonus rounds, to boot! So long as you track your deposits, the mobile casino pay with phone credit strategy is superb if you want to hold back financial details and still deposit quickly and easily. At the same time, you will always be protected by our state-of-the-art encryption technology. There are more than one phone-billing payment options at this point. That is good for players, but means they have to go one extra step to find out which type of pay by phone option is offered at a particular casino. At Lucky Admiral, for instance, we give all of our crew mates access to the extremely popular Payforit tool used for phone bill payments. Payforit represents a collaborative coming together by all of the UK’s major mobile telecom providers, including 3, EE, O2, and Vodafone. One of its best aspects is the utter simplicity, alongside small monthly charging limits of £10, £20, or £30. If you think you could get into trouble after falling in love with mobile slots, then our mobile casino Payforit option is ideal. Using your phone bill is extremely safe. That is because it basically functions like cash and entirely shields your financial information from online vendors. Payforit’s monthly limits of £10 to £30 provide three handy options for casual or infrequent players to set budgets for their mobile gaming allowance. The fact that the amount spent shows up on an existing bill is very straightforward and easy to track online. Players with larger weekly budgets could make good use of a strategic phone payment for a quick top up to enhance a rewarding session. For some, the maximum monthly limit of £30 is a drawback since it imposes a relatively low overall restriction. Another drawback is that Payforit cannot be used to make withdrawals, so players will need to find an alternative payment method, such as PayPal or a credit card. Obviously, Payforit (for UK players) is geared more for casual punters. Also, your account could be at risk if you lose your phone, but this can be lessened with adequate security measures in places. Although the ol’ plastic is a financial tool adapted from the pre-Web world, it still works well as the standby withdrawal method at online casinos. It offers instant transfers and no surprises. In fact, a traditional bank transfer and credit cards are the two most conventional ways to take cash out of your casino account. There should not be any hidden fees interacting with the casino; however, if you move your cash with your card company this might incur bank charges. Keep in mind that in many cases, if you deposit with a credit card then you are asked to withdraw associated funds using the same card also. On the down side, working with cards online can be tricky, because as soon as you share the card information and personal details they are a security risk (wherever they are stored on file and during transmissions). The king (and queen!) of online payment and withdrawal services is definitely PayPal, as long as a player is looking for a robust financial tool. Some players want alternatives to credit cards yet do not need a powerful service like this premier e-wallet, so they might opt for simpler things like the Paysafecard cash voucher (for deposits only, though) or a simpler e-wallet. With PayPal there are no transaction fees, and the transfers are instantaneous. The nice thing about PayPal is its value for both deposits and withdrawals, which keeps things easy to track and budget. Also, PayPal has introduced instantaneous free cashouts to users’ connected bank accounts! 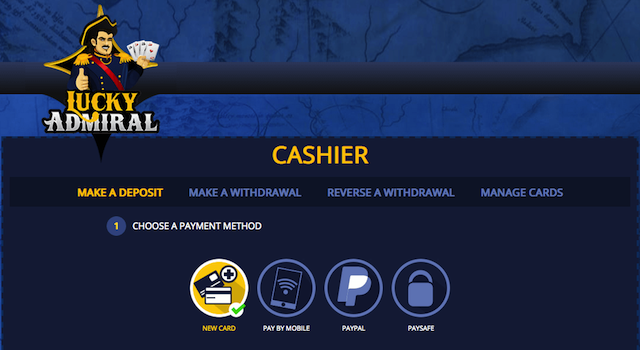 Lucky Admiral is a PayPal casino, so you can definitely use this method here for both deposits and withdrawals. Neteller has carved out its niche as a simplified e-wallet by being useful at Websites of great interest where other payment options are not available, such as for gaming, entertainment and even currency exchange. Neteller has become perhaps the most visible and common option at casinos (even more common than PayPal). You can use a Neteller account in a simple way, or you can use its features like getting a connected prepaid card. Keep in mind that unlike PayPal, there can be fees (2.5%) for moving money to your Neteller account from a VISA. Still, for gamers, a Neteller account is becoming a must-have in order to ensure access at a large number of online casinos that have offered it for some time already. Skrill has been gaining enormous ground and swallowing up other popular services like Ukash. Like Neteller, it is the main competition for PayPal as a withdrawal-ready e-wallet, and it has a considerable footprint in the online gaming world, too. Unlike PayPal, however, Skrill levies 1% fees for sending money to friends. The Skrill e-wallet approach is simpler than PayPal and it stresses its basic security aspect (since it protects a user’s financial connections and provides a same-as-cash payment method online). Another benefit, which may not be important to everybody, is that Skrill operates in 40 currencies. Lastly, we just want to encourage you to check out your alternatives and options for handling casino deposits and withdrawals in the safest and most convenient ways possible — and you do have some great choices! The pay by phone casino option is a clever and highly workable deposit solution, especially for casual punters, or for anybody’s impromptu top up to continue a fun session.